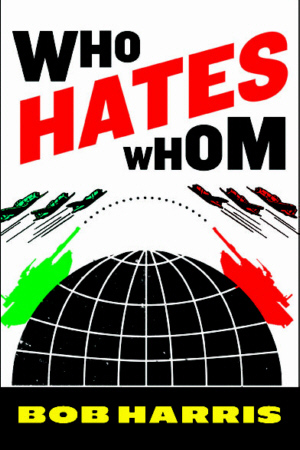 WHO HATES WHOM is a simple book of maps and accompanying text providing a country-by-country breakdown of who hates whom in ethnic, religious, economic, and territorial conflicts worldwide. Each deadly conflict, grim tragedy, and dreadful threat will be festively illustrated by brightly-colored maps covered with eye-catching arrows, symbols, and explanatory icons. If a baseball game is more enjoyable when you’ve got a scorecard, then WHO HATES WHOM will make living on Earth just a little more fun. Each major nation of the world will get a page or three; more conflicts mean more pages. Russia may be worth four, while Iceland may deserve… well, maybe its name. Arrows pointing outward on each map will indicate conflicts with bordering nations; smaller two-way arrows inside a country will indicate civil war or other local territorial strife. Everyone will likely hate at least one page of the book – the one describing his or her own hatreds. Finally, WHO HATES WHOM will end by looking forward: Who’s Gonna Hate Whom, providing predictions for future conflicts.